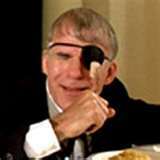 If you'be ever seen the movie "Dirty Rotten Scoundrels" with Steve Martin and Michael Caine you will doubtless remember Mr. Martin's portrayal of "Ruprecht the Monkey Boy" who, owing to his misfortunes must have a cork on his fork lest he hurt himself at table. Now of course if you're a sensitive person or a righteous one you will be properly apalled by the movie's strategems knowing full well that the world of people with mental disabilities remains a terrible outpost of conditional human rights to say the very least. Then again, within the dynamics of plot, Steve Martin and Michael Caine are scoundrels, and Ruprecht is a posuer, the putative burden that Mr. Caine must carry thorugh life–the unfortunate grown child that he must contain in a quaint dungeon filled with monkey toys–for what else is a good man to do? And Mr. Caine is hunting for a credulous rich woman to marry so he can steal her millions. Well, thinking of Glenn Beck's march on Washington I was reminded a bit of Ruprecht for Mr. Beck and the Tea Party are the agents of the corporati, who are in turn the rotten scoundrels of our time, who in turn will bilk the old lady out of her last nickel in the name of responsibility–we the upright, we the moral and just shall save the nation by fiscal responsiblity. This of course will mean a return to America of the 1880's–see Ruprecht, be-dungeoned, as all the poor and dazed must be. Make no mistake the Tea Party is as dangerous as can be for its paths to the civic square are as devious as those of Mr. Caine and Mr. Martin in the film aforementioned. The aim of the Tea Party is to steal people's loot while simultaneously appealing to their poorly examined sentiments. If they succeed in developing a real electorate then we will be fighting over who gets to live in the sreet and who gets to live in a state sponsored dungeon. This is not much of a joke. Still I love the image of Ruprecht above with his cork on a fork. I know what he feels like. I really do. This entry was posted in "Disability" News, Current Affairs by skuusisto. Bookmark the permalink.